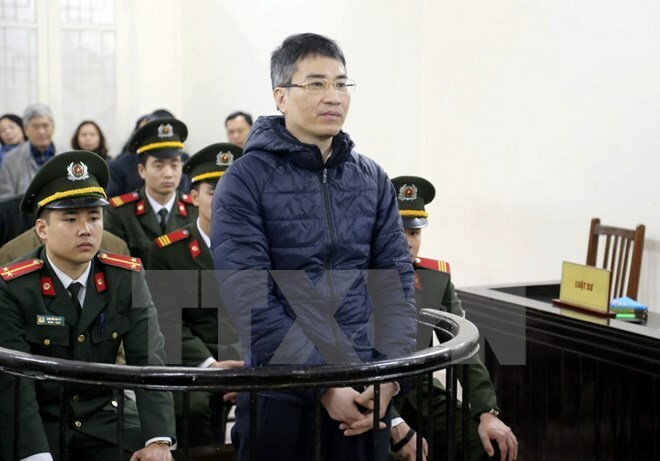 Hanoi (VNA) - The High-Level People’s Court in Hanoi on August 18 upheld death sentences on former General Director of the Vinashin Ocean Shipping Co. Ltd. (Vinashinlines) Tran Van Liem and former acting head of Vinashinlines’ sales department Giang Kim Dat. Both of them were charged with abusing position and power to appropriate assets. The court also kept a life sentence on Vinashinlines’ ex-chief accountant Tran Van Khuong and a 12-year jail sentence on Dat’s father Giang Van Hien, who was absent due to health reason. The court also maintained its decision to reclaim 40 properties and two automobiles. All money confiscated in the case will be returned to Vinashin. The Hanoi People’s Court previously held that there are sufficient grounds to confirm that during the process of purchasing and leasing ships from 2006 to 2008, Liem, Dat and Khuong had abused their position and power and appropriated more than 260 billion VND (11.4 million USD) of Vinashinlines. Liem stole 3.1 billion VND (138,000 USD), while Dat embezzled around 255 billion VND (11.34 million USD) and Khuong 110,000 USD. Liem was pinpointed as the ringleader in the case, while Dat was a proactive accomplice and Khuong was an accomplice.